Rubble from a collapsed wall may not have conveniently bridged the dry ditch or moat. One way or another, though, attackers had to cross to reach the breach. From 1556 on, a last obstacle often lay in directly in front of the ditch and wall. Before besiegers could make the final assault, they had to secure the covered way. This may have meant an intense fight, with those on the wall shooting down in support of their comrades desperately trying to hold the covered way. Once the covered way was seized, though, the way to the wall lay open. Hence the phrase of the 17th century: "Covered way lost, everything lost!" If a dry ditch, attackers were sometimes able to scramble down the sides, dash across the bottom and then up the rubble field to the breach, taking casualties all the way. If the ditch sides were too steep and too deep, or if there was a water-filled moat, the attack stalled. One quick remedy was to resort to fascines. Soldiers and conscripted civilians carried fascines to the edge of the ditch and threw them in. If not shot, each ran back for more (or a chain of men passed fascines from one to another up to the ditch). If instead there was a moat, rocks could be bound inside the fascines to have them sink when tossed in. Musketeers and artillery provided intense cover fire. Enough fascines made the ditch or moat negotiable. Should besiegers have planned not making a deep, passable breach in a wall, but instead come sufficiently close to have large numbers of soldiers scale the wall, covered passageways were constructed across the floor of the dry ditch or over the water of a moat. If across a dry ditch, a tunnel was started at the outer edge of the glacis to emerge at the bottom of the ditch. Tunneling was handled just like mining. Once having broken through onto the ditch floor, men built a passageway of wooden framing, with sides and top covered with fascines and/or wool bales and/or dirt and/or animal hides - whatever was available to put some thickness between attackers and musket fire. There were sieges in which such a passageway continued all the way across the dry ditch and then miners bored under the wall to go on to make a chamber for blowing the wall. For coping with a moat, first the sap was extended through the glacis to the moat's edge. The floor of the sap ideally went down to the water level. Crossing a moat, dirt, rock, fascines, rubble, etc., etc., were dumped in front of the construction to provide a platform. Once the fill reached above the water line, workers then evened it out, adding more material where needed, and covering all with a layer of earth to make a causeway. Like the passageway across the dry ditch, its brother going over the moat too had a wooden frame covered with whatever would stop enemy shot. In most illustrations of these covered passageways under construction, nothing is shown to indicate what the builders did to protect themselves while working. John Muller shed some light on this, fortunately. He said attackers focused their musket and cannon fire on the defenses in the immediate vicinity of the work to force the besieged to keep their heads down. By this point, not many heads may have been kept down due to losses by combat, disease and hunger. Mention was also made of fascines piled in front of the work and moved along by throwing them over. 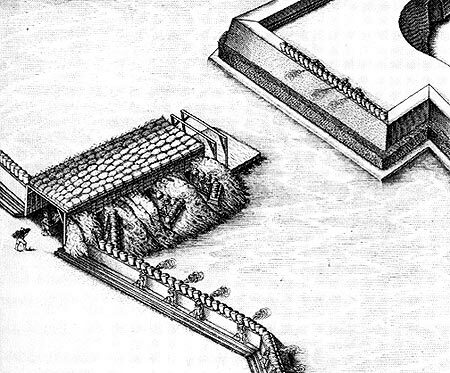 One of his illustrations showed a mantelet parked in front of the opening of a covered passageway in a dry ditch. Once across and the last wall breached, all that remained was the final assault.